Eight Euros gave me a round trip ticket to the quaint town of Castel Gandolfo. While it's known as the location of the Pope's vacation residence, this mountainside village also boasts the best ravioli I've ever eaten. On this cloudy Friday afternoon my friends and I witnessed true Italian happiness. They left the doors to the cathedral wide open during the ceremony, and from the gelato shop across the courtyard we watched this beautiful couple get married. 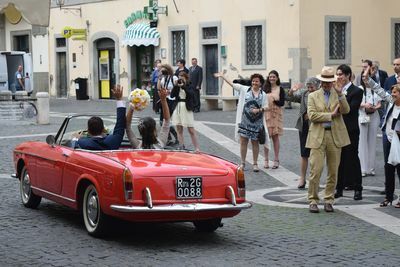 Carroll, Christine, "A Cloudy Day, An Italian Wedding, & A Red Fiat" (2016). Study Abroad Photo Contest. 38.